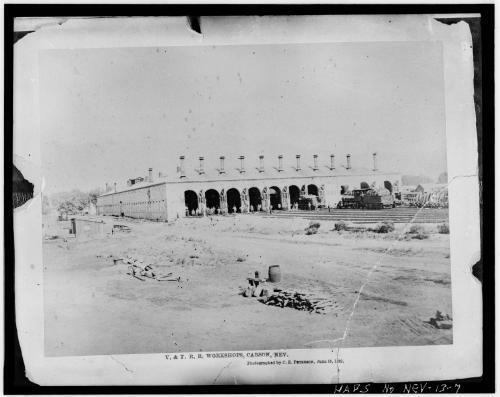 These two pictures of the Virginia and Truckee Railroad Shops are the newest ones in the collection. They barely make it in – I have an arbitrary cutoff of about 1980 for what’s considered “contemporary” compared to “historic”. But I also allow myself to make exceptions; if you have a photograph of something that’s not around anymore, you’re in. These photos are from about 1985, and they show how run-down the shops had become by then. 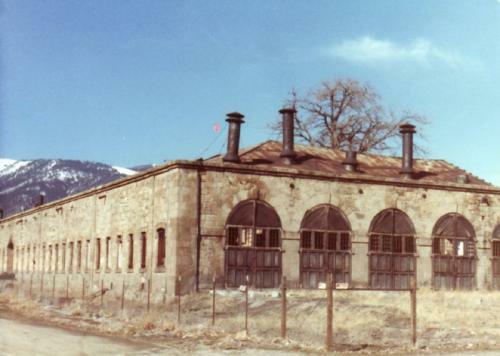 The shops were built in 1873, and were the main enginehouse and machine shops for the railroad for the rest of its existence. In 1950 the railroad went out of business, and the shops were abandoned. Many proposals for renovating them were talked about, but none of them gained any traction. 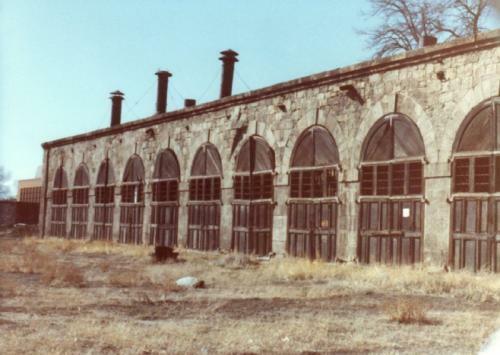 In 1991 the shops were dismantled and the bricks sent to the Napa Valley, reportedly to be used in the construction of a winery. The decay in these photos is starkly visible. Funnels are missing, the roof is caving in, and some of the bricks look to be falling out. You can see why this building, without any kind of upkeep, would have been declared a hazard. I think it just reached a point where it had to be torn down before it fell down. It’s too bad, but by the time of these pictures, the cost of renovating the shops would have been astronomical. Here’s a picture of the shops in their heyday, just so we don’t end this post on a depressing note. 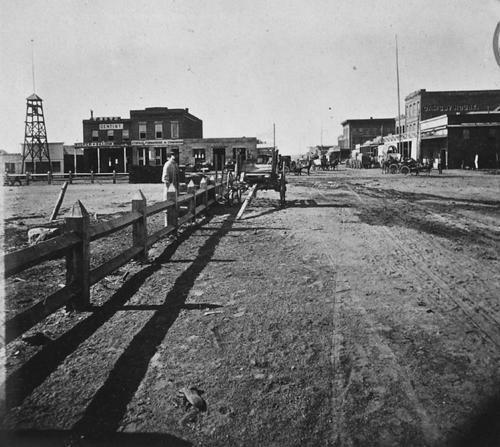 The date here is June 16, 1882, and everything looks sparking and new. I just made a major add to the WNHPC today, a good section of the Lawrence & Houseworth collection. Lawrence & Houseworth was a publishing firm that formed in San Francisco in the early 1860s, specializing in scenic views of the California and Nevada mountains. This was back when travel was a huge undertaking, and people who lived in the city would never get out to see the land. So they would instead buy photographs of exotic places like Yosemite, Lake Tahoe and Virginia City, places they had heard of but would never in their lives visit. Lawrence & Houseworth weren’t photographers themselves, they were just businessmen. So they bought negatives off of photographers with an existing library, or hired their own photographers to travel all over California and take scenic photos. This is back in the day when a camera was the size of a small dog, and it used fragile glass negatives the size of a sheet of paper. So going out into the wilderness to take some pictures was an enormous undertaking, and these photographers would set out on expeditions that could last months. 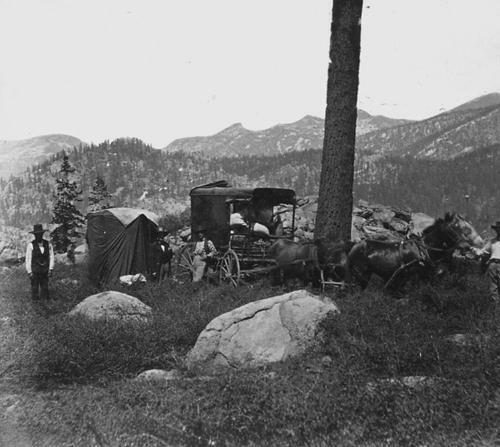 They would take entire wagons with them, loaded down with food, bedding, and photographic supplies. While searching through some old pictures, I found an entire series of Lawrence & Houseworth photos that document such a trip. The photographer was on an expedition to Lake Tahoe and Virginia City, but he did something rather remarkable. Instead of keeping all his gear packed away until he reached the destination, he stopped and took pictures all along the route. So when you look at this series, you can see the expedition starting in Placerville, making their way up the wagon roads (following present-day Hwy 50), going over Echo Summit, and stopping at Lake Tahoe for a few days. Then they made their way down into the Eagle Valley, stopping at Carson City and taking what is probably my favorite photo of Carson. 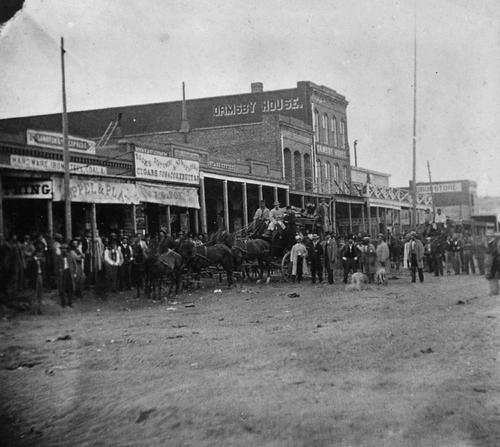 I used to think this was from the 1870s, but now that I know it’s part of this series I think the date is probably 1864, the year Nevada gained statehood. 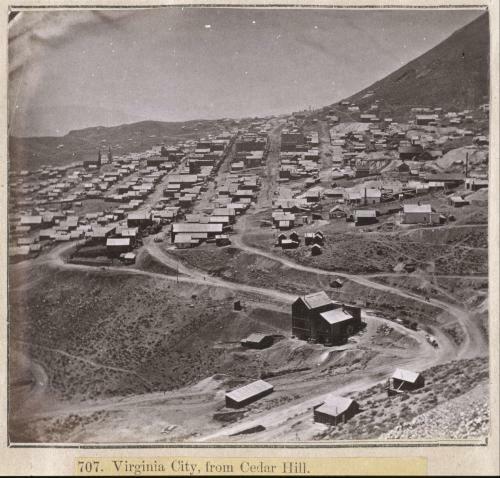 After a brief stop in Carson, it was on to Virginia City, where they took some fantastic photos of a town in the middle of a boom. 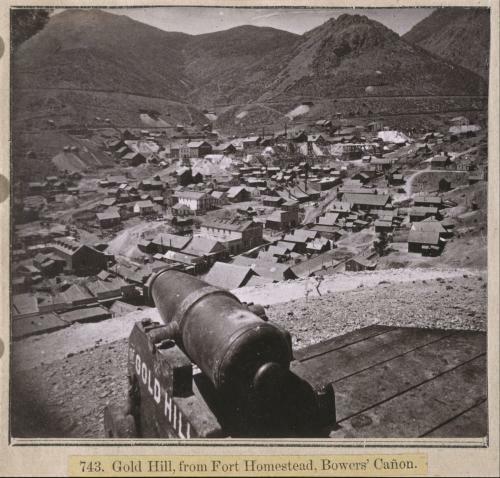 They traveled from one end of town to the other, taking photos of the main street, the mining works, and panoramas from up on the hills. At the time of these pictures it had only been five years since gold was discovered on the slopes of Mt. Davidson. Everything in these pictures had been built within the last 3-4 years, creating a city out of the barren scrub. In 11 years, in 1875, just about everything would burn to the ground in the Great Fire. After a flurry of picture-taking in Virginia City and Gold Hill, the expedition’s goal was met, and it kind of petered out. During the trip home they snapped a couple of pictures of Washoe City, but that was it. They packed up their equipment for good and headed back to San Francisco to get the photos published. This whole series was so fantastic that I couldn’t just pick and choose a few of the pictures to put here. Plus, the general idea of the WNHPC is about volume and completeness; collecting every picture I can, and sorting them out later. So I’ve grabbed the entire sequence of photos from this expedition (well, I didn’t grab them all; just from Echo Summit on), 118 in all, and put them up on the WNHPC. You can just start here and use the Next buttons at the bottom of the page to jump through all the photos. Welcome! 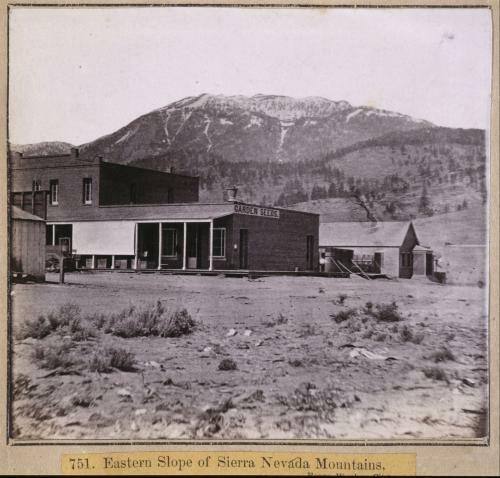 This is the news and updates blog for the Western Nevada Historic Photo Collection. It’s also a place that I’ll be pulling out and featuring some of my favorite photos from the collection. So keep checking back, or better yet subscribe, to make sure you keep up on all the new stuff that’s going to be happening at the WNHPC. 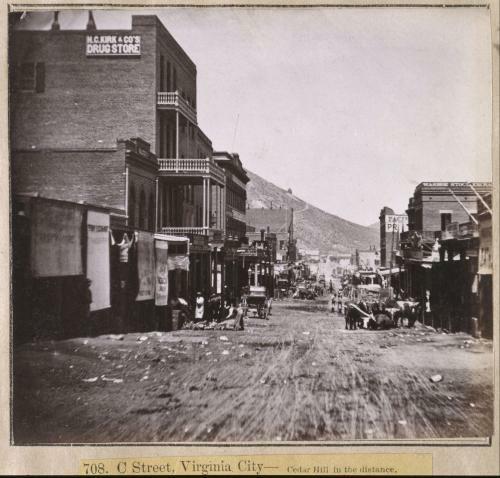 I built the WNHPC as a way to gather together all the historic photos of Carson City, Virginia City and the surrounding areas that I’ve come across over the last few years. This is some great stuff, but it’s all scattered far and wide across various different websites, and various different library books. All this stuff needs to be in one place, web-friendly and searchable, and that’s the point of the WNHPC. I’m still working on building some more advanced features, but for now the site is up and running, with new pictures being added fairly often. Remember, probably the best way to keep up with all the new additions to the WNHPC is to watch this blog, and to subscribe to the main photo feed using your favorite RSS reader. And please don’t be afraid to comment or write me, and if you have any photos you’d like to share go ahead and send them my way! I’m always taking submissions for the site.